The future has officially arrived, ladies and gentlemen: El Steve just made a video call to Jony Ive as part of his famous “One more thing” sequence of the Apple WWDC. The new feature is called FaceTime, and currently only works on WiFi connections. 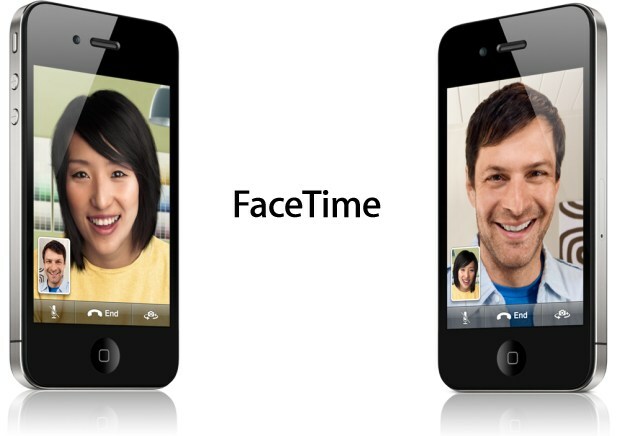 You can video chat (or “get some Face Time”!) in portrait or landscape mode using the front or rear iPhone 4 cameras. 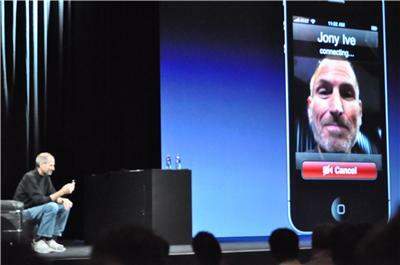 Word just came in that Apple plans to make FaceTime an open standard. Kudos to them for that! FaceTime will work over WiFi only for 2010; the audience was rather disappointed at that, but let’s be honest here: AT&T can barely keep a regular call going, much less a video call. Right now it’s also only iPhone 4 to iPhone 4, but Steve referred to “FaceTime devices,” implying this functionality will shortly be available on other gadgets. iPod touch? iPad? Mobile-to-desktop? The possibilities are… well, those. It uses either the front or rear camera, with a handy switch button so you can say “Ladies, look at this! Now look at me.” You know, like the guy in the Old Spice ads. The front camera is VGA, so I’m guessing the rear camera sizes down to that as well when broadcasting. Mr. Jobs said it takes no setup and just works, as long as there aren’t literally 500 Wi-Fi points interfering with your signal. There’s a video up at Apple’s site if you feel like watching.